Just like clockwork every four or five years Blue Springs South meets up with CBC in the Missouri Class 6 state championship game. The first time was 2006 when the Jaguars rolled the Cadets 41-7 to win the first state championship in school history. Then in 2011 South found its way back to the Edward Jones Dome in St. Louis only to find another undefeated CBC squad waiting for them. That time it was much closer but the 12-2 Jaguars brought home another title with a 40-37 win. This time around it’s more like 2006 as both teams enter with perfect 13-0 records dominating both sides of the ball. This game reverts back to what has become the classic question. Which side of the state East vs. West plays the best brand of football? Since Missouri went to six classes in 2002 Kansas City schools have won eight titles, St. Louis has won four and Columbia one. 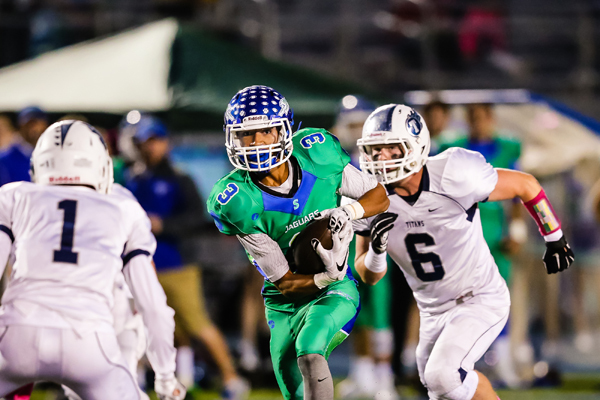 The power has rested on the West side with the three dominant teams Blue Springs, Rockhurst and Blue Springs South. If the Jaguars win this year they will match their other KC rivals with three titles in four trips in the six class era. There is plenty of history heading into this game but this year is another group of players who are trying to write a history of their own. There are plenty of players from CBC who were a part of the Cadets 31-24 win over Rockhurst last year but these Jaguars have never been in the Dome before. With this level of unfamiliarity the focus is on what each of these teams bring to this game. South has a team that has grown as the season has gone on to become one of the best teams in the school’s history. The Jaguars were just a 5-6 team last season and now stand one win away from a state title. South coach Greg Oder said his team has really grown over the last 12 months. CBC enters with a dynamic offense led by K-State commit Tre Bryant and plenty of other weapons on the offensive side. The Cadets are averaging 51 points a game led by Bryant and quarterback Blake Charlton who has thrown for 2,774 yards and 32 TDs. Bryant has 1,145 on just 110 carries to go with 24 touchdowns of his own. The Cadets explosive offense will go up against a South defense that has been fast, physical and aggressive holding its opponents to just 13.7 points per game including three shutouts. The Jaguars have a big physical defensive line that eats up the other team’s offensive line and allows fast linebackers like Adam Cofield, Hunter Jenkins and Jake Lamb to fly to the ball and make tackles. CBC coach Scott Pingel said his linemen will have to be able to get to those linebackers to keep them from making plays all over the field. When South has the ball the offense will give CBC a lot of different looks. Noah Nigro has been a steady force for the Jaguars at quarterback throwing for 26 TDs with just six interceptions. He has 1,577 yards passing to go along with 590 yards rushing. When the offense looks to keep the ball on the ground they have several outstanding options led by Cofield and his 1,224 yards and 13 touchdowns followed by Kaylob Hutsell who has 516 yards and five TDs and Jerome Hawkins with 419 yards and nine TDs on just 50 carries. Pingel said South has a lot of weapons and size that his team will have to deal with. While a lot has changed in football in Missouri over the last decade and a half this Class 6 battle lines up like many have before. Can the speed and offense of teams from St. Louis stand up to the size, speed and physicality of teams from Kansas City?